Should You Have a Plan Before Finding a Builder? - Canterbury Homes Inc.
We are often asked by clients if they should have a plan before finding a home builder. 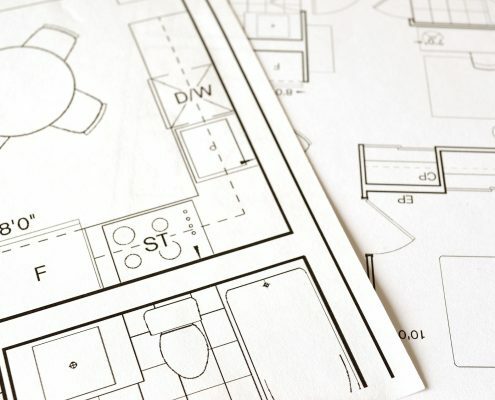 It may seem like a good idea to start with a plan; however, there are many different approaches when it comes to planning a new home build. Some people come to us with very specific plans, while others are not clear on what they want. We often find that our clients have not found what they are looking for in the current inventory of houses for sale and have decided to build in order to piece together their ideal home. Starting the design process is not an exact science; however, in most cases, we start with a lot in communities such as The Grange Country Estates, Meadow Hawk, and Sherwood Golf and Country Club Estates. Once the lot is chosen, we look at the land size, the desired orientation (with regard to land features, desired sunlight, proximity to the road, etc. ), and location. The lot size will help us determine the size and layout of the house. For example, to maximize square footage on a smaller lot, our clients may choose to build a two-storey rather than a bungalow. After determining the layout of the home on the property, we move inside: planning the layout of the interior. We ask our clients thought provoking questions to help discover what their needs are. This is especially important when, for example, a husband and wife come to us with opposing priorities. Knowing how many occupants, their ages, what their budget is, how each space will be utilized, the number of bedrooms and bathrooms they need, etc., will help them reach a consensus based on their needs while leaving room for their wants. Another important consideration is what will their future needs look like? Do they have aging parents that may require special needs? In that case, perhaps a future elevator shaft installed during the framing stage will give the clients an accessible option should there be a need for anyone with mobility issues. Does anyone have an illness? Do we need to consider wider hallways and bathrooms for wheelchair access? Although we cannot always predict what the future holds, some families have a clearer idea of how their family will use the home as they age. A home office is a common request. The benefit of custom building is the option of deciding how the office traffic will be handled. Could the office be accessed from the exterior of the home? Could there be a private entrance off the front of the home along with a bathroom to ensure clients and home occupants both have the privacy they require? Are there special requirements such as electrical, sound, lighting? The design process will ensure all the “must haves” are considered and integrated seamlessly into the family home by the home builder. The style of the home can be another aspect our clients may or may not be clear on when they begin to plan their new home. For the most part, we find that clients are not aware of what is available to them on the current market. During the building process, each client will have the opportunity to visit local suppliers to peruse the latest and greatest “new” products. At Canterbury Homes, our Designer, Monique Gorda, will assist with each decision to ensure product choices are both aesthetically pleasing and serve their intended purpose. Images help buyer and builder get on the same page in the planning process. Images can be very helpful for getting home builder and buyer on the same page. We will ask clients to send us pictures of what they like and dislike and why. These pictures can add to the clarity of their message and help us determine what they want and need, even when they are not sure themselves. The images are an important part of the process, it is usually our “jumping off” point and sets the direction of the project. Sometimes these images and ideas will feature styles and products that are better suited to different climates. Clients may want something that is not suited to, or is difficult to find in the Edmonton area. This is where Canterbury Homes Inc. shows our expertise. We source out products that work in our climate and have quality staying power. Products that work for sunny California may look great when they are initially installed; however, Central Alberta weather is very tough on products that aren’t made to withstand our extremes and could look old and worn long before they should. We want our clients to love their homes on their moving day and throughout the years they live in their home. Look for images and inspiration on Houzz, Pinterest, or our Gallery. Should You Have a Plan Before Finding a Home Builder? The answer to this question is “No.” You do not need to have a specific plan in mind (or on paper) before you choose a builder. A wish list and some general ideas of how the home will function is enough information to get the process started. Canterbury Homes Inc. works with you to determine your needs and wants and then creates a plan to reflect those desires. If you have a plan, we can develop that plan and show you your options. In either case, communication is key. We learn your story… then custom build your dream. It is your story that determines our home building journey, this will ensure you will be delighted with your decisions for years to come. PrevPreviousHow Much Square Footage Do I Need?